Above: Katherine White signs on the dotted line to play at Missouri Western State University surrounded by her parents Brad and Darcy White. Behind her Assistant Volleyball Coaches Laura Kroll (left) and Katherine Smith (right). It wasn’t hard for Exeter-Milligan three-sport standout Katherine White to decide where to continue her education. It was all about the volleyball. 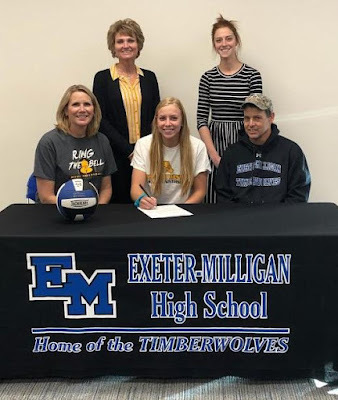 White, who has been an all-state outside hitter for Exeter-Milligan the last three years of high school, signed a letter of intent to play for Missouri Western State University in St. Joe, Mo. White who had a team high 454 kills her senior season balanced this with her 251 digs for the season and 63 ace serves for the team. This season she broke the school record in kills and in points scored in one season. Her high school career made an impact on Exeter-Milligan volleyball records. In her career she sits in the second place spot for total kills with 1154, in first place for total aces with 199, in third for total digs with 865. One thing different at NWSU is White won’t have her mom, Exeter-Milligan Coach Darcy White, as her coach. Katherine has played under different coaches on club volleyball teams and had no qualms about the experience. While she is keeping her options open right now, White has an inclination to pursue a career in education. She has a bit of a head start as she has been taking college level courses at Exeter-Milligan this year through SENCAP (Southeast Nebraska Career Academy Program). White sends a kill over the net at her last high school volleyball game in the state tournament against Wynot.